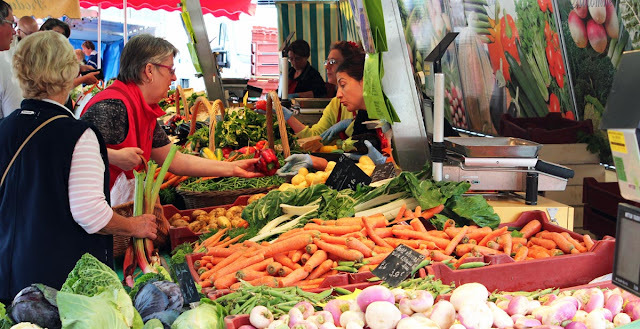 Radishes are a common sight in markets from spring through the end of summer. 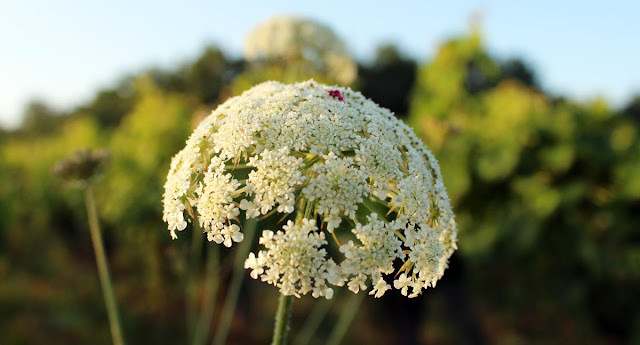 Big bunches of radis roses (the red and white variety pictured here) abound. We eat them with salt and buttered slices of baguette. A real summer treat! A bunch of radis roses at the market. This cool wet year has been heaven for the limaces (snails and slugs) around us. You may remember how they ravaged my bean sprouts in the vegetable garden a few weeks ago. We're also seeing the big European red slugs in great numbers out in the vineyard and the surrounding woods. A European red slug feasting up in the branches of some leafy green plants. While this summer has been a bit of a disappointment, we just had a glorious week of sun and heat. It was nearly too hot for sleeping a couple of nights there. Now we're back to more reasonable temperatures between 20º and 25º (the high 60s/low 70s F). 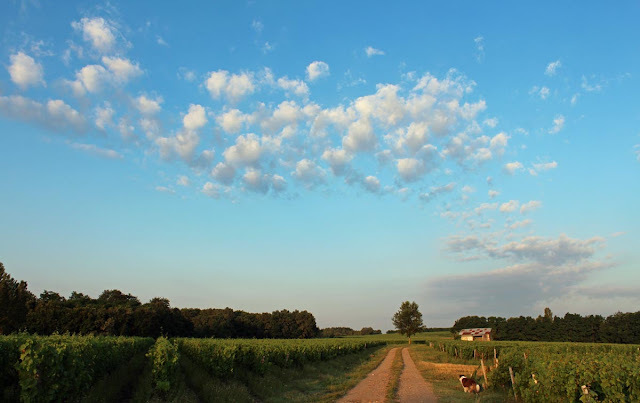 Last Thursday morning's walk through the vineyards with Callie. It didn't take long for those clouds to melt away. The vegetable garden enjoyed the heat; it gave the plants a little push and they're looking good. The beans are producing and we're within a few days of the first harvest. The outbuildings at Montpoupon, that is the stables, workshops, cellars, and servants' quarters, have been converted into a rather extensive hunting museum. The château was, and is, home to a long line of hunters. And they have the antlers on the walls to prove it. Looking across the courtyard from one room of the museum to some others. Mid summer is also the time for daisies. Big ones, little ones, everywhere. 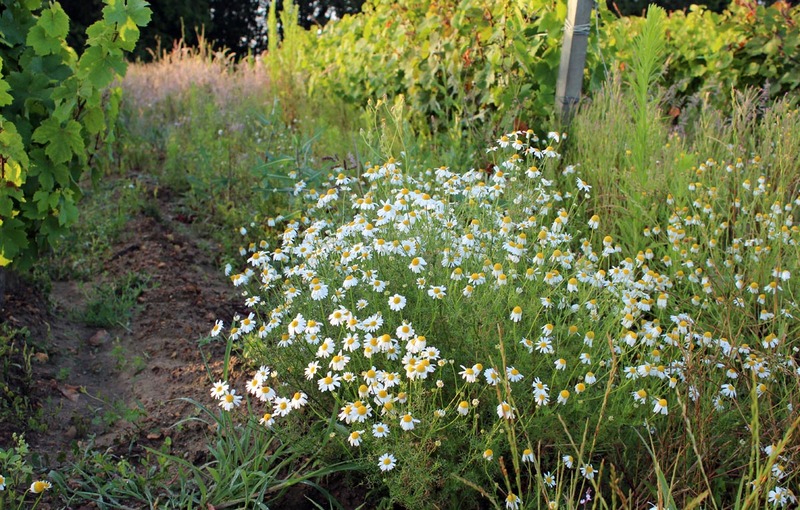 We have some large variety in our garden, but these are a much smaller version that grows wild in the vineyard. 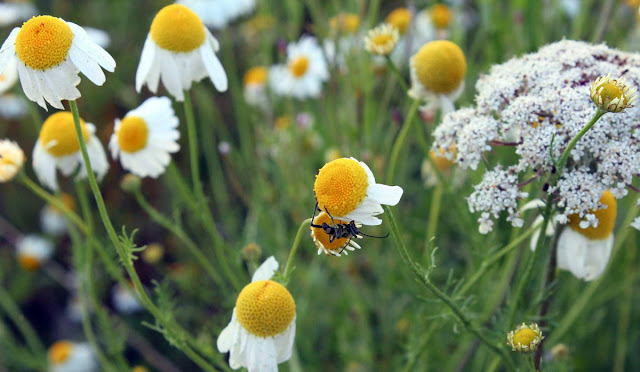 My extensive quite limited research indicates that it might be called pyrète de Dalmatie (tanacetum cinerariifolium), although I am quite unsure of this. So I just call them "little daisies." A patch of little daisies between rows of grape vines. An insect hangs upside down in the early morning chill. Summer is nearing its halfway point. The carotte sauvage (wild carrot or Queen Anne's Lace) is in full bloom. I associate the plant with late summer, but it's here now. I hope that's not a sign that summer will end early. Some of the flowers form a ball shape. 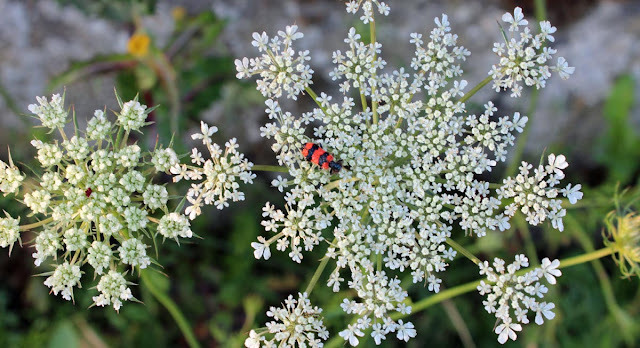 The small red flower at center attracts insects. A more characteristic flat flower head with a special guest looking for nectar. I wouldn't be singing if I had to sweep this chimney. Or any chim chim-in-ey, for that matter. 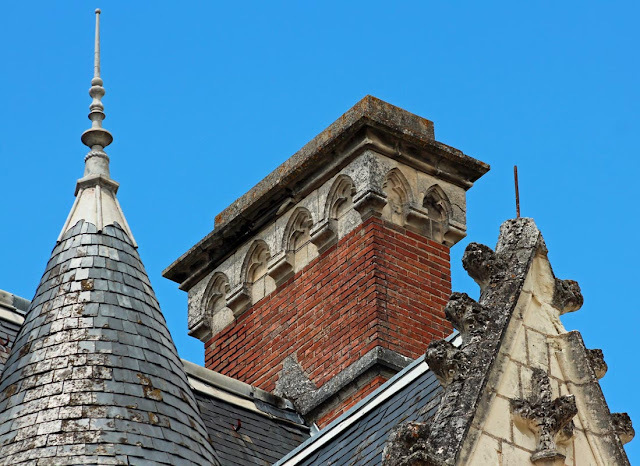 A chimney on the roof of the Château de Montpoupon. It's a bike race, too? 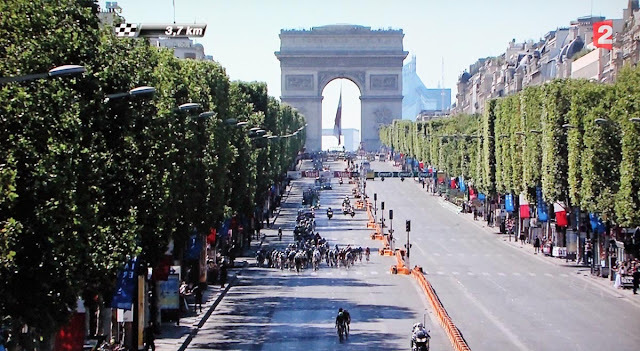 I like to watch the Tour de France each year. For me, it's less about the cycling and more about the scenery. 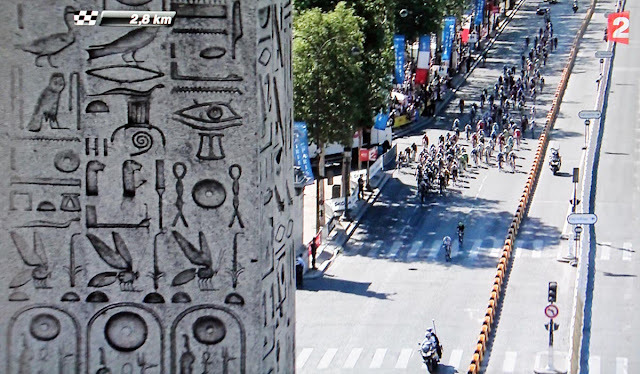 During the several hours of television coverage each day of the race, the helicopters following the action take beautiful aerial pictures of the countryside, towns, and castles along the race route. The Eiffel Tower on the Seine. Just so you know it's Paris. 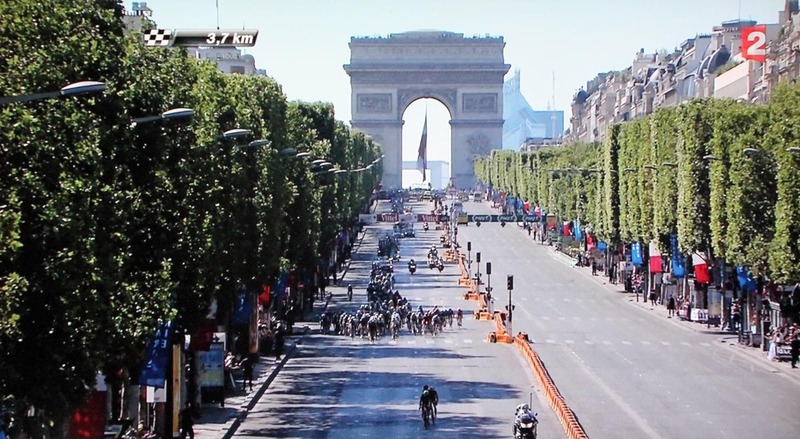 On the last day of the race, the cyclists ride almost ceremonially into Paris (there is a serious sprint near the end, but it usually does not alter who the winners will be) and the sky shots of the city are great. Here are a few that I took by pointing the camera at the television screen (there are some ground shots, too). 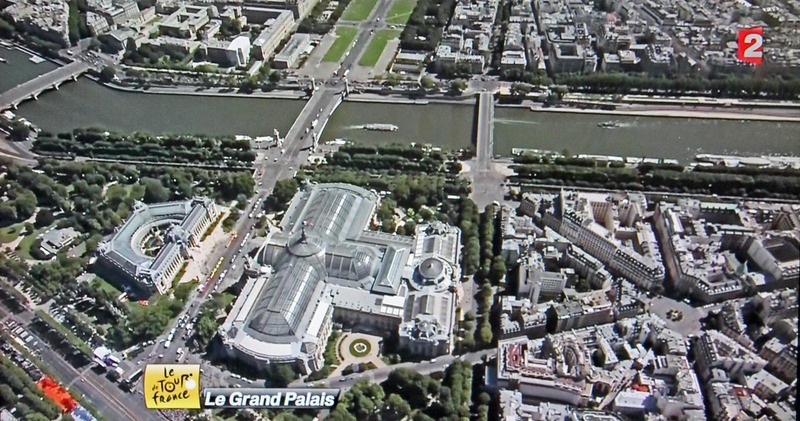 Le Grand Palais. Oh, it says that on the screen. Duh. 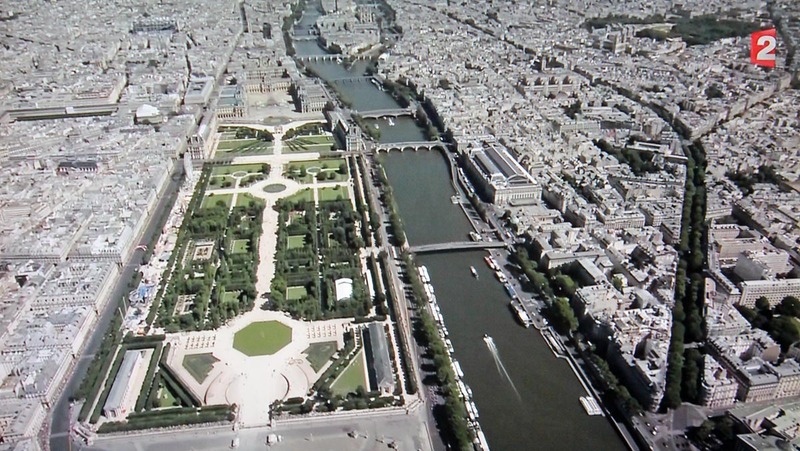 The Tuileries garden and the Louvre behind it (at top). The big building across the river is the Orsay Museum. The Luxor obelisk on the Place de la Concorde. Nice camera work, guys! The Arc de Triomphe on the Avenue des Champs Elysées. 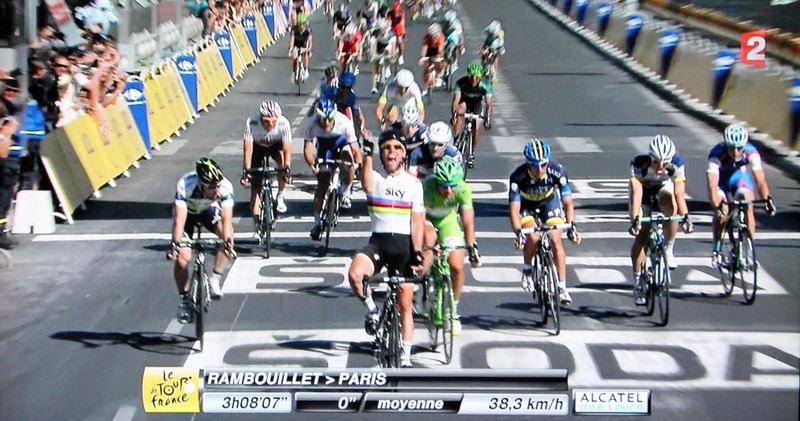 Mark Cavendish wins the stage, but not the race. Touched by the morning dew. The vineyard is full of these right now. 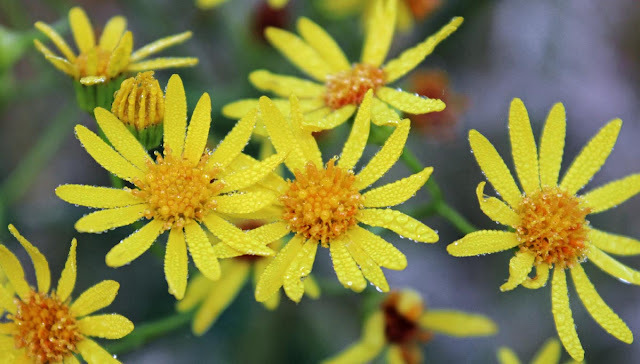 I think they're called ragwort in English, séneçon de Jacob in French. That's just a guess. If you look closely, you may be able to see the drops of dew on the petals. Click to dewinate. The photographer finds himself in a convex mirror. 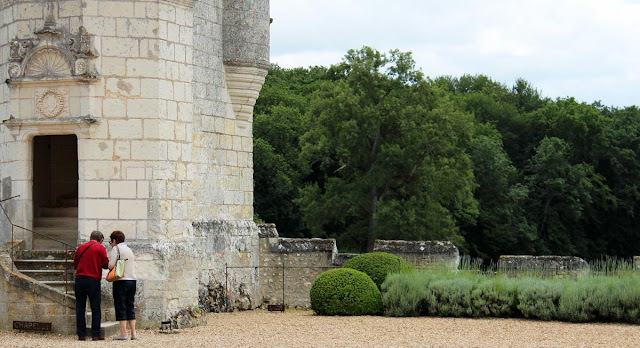 At the Château de Montpoupon. Don't you think it would look great in a corner of our garden? We already have a well. On the grounds at the Château de Montpoupon. The chilly gray weather we're having this season is not playing nicely with the agriculture. Everyone is complaining that the fruit trees are not producing, that the vegetable gardens are struggling, and that the grape yield will be down at summer's end. Immature grapes on the vines out back, mid-July 2012. Still, there are some grapes and they seem to be coming right along. 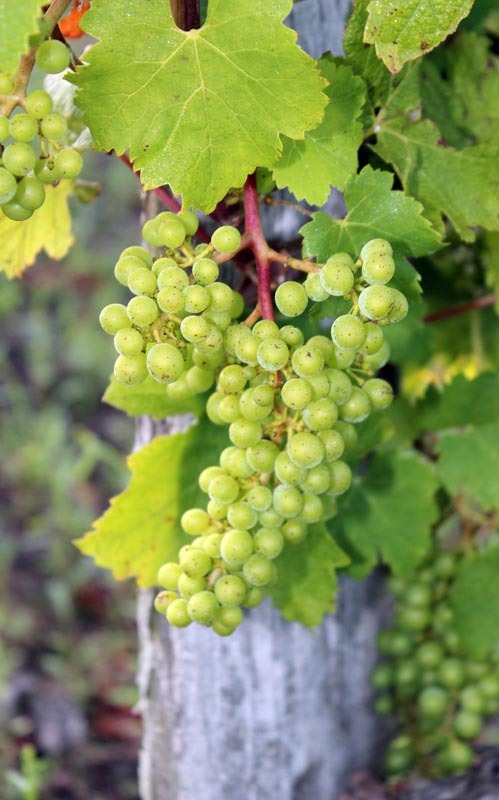 It will be interesting to see, and taste, what next year's wines are like. I don't know who they are. They don't know where they are. There's kind of a cosmic symmetry to it all, n'est-ce pas? "I told you Eugénie, you have to go up these stairs." "Give me that map, Jacques. Do you seriously think they'd put the ladies room at the top of the tower?" The banner photo (above) was taken from a distance, across some fields looking approximately northward toward the Château de Montpoupon. 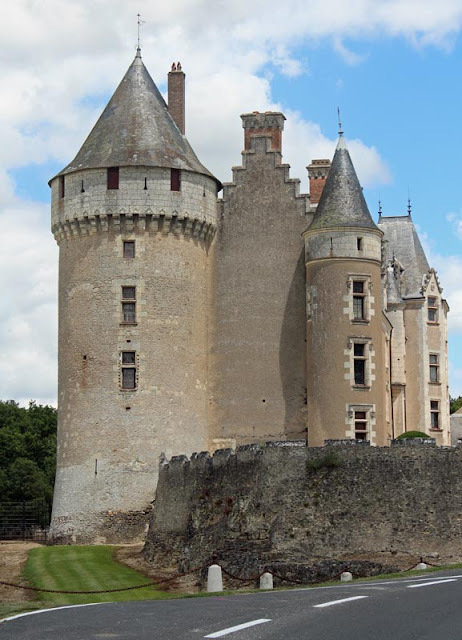 These next pictures offer a closer view, both of the exterior walls built in the medieval fortified style, and the interior renaissance facade on the courtyard side. Built in the style of a medieval fortress (this is not the original medieval building). The courtyard side of the main building, still inhabited today. 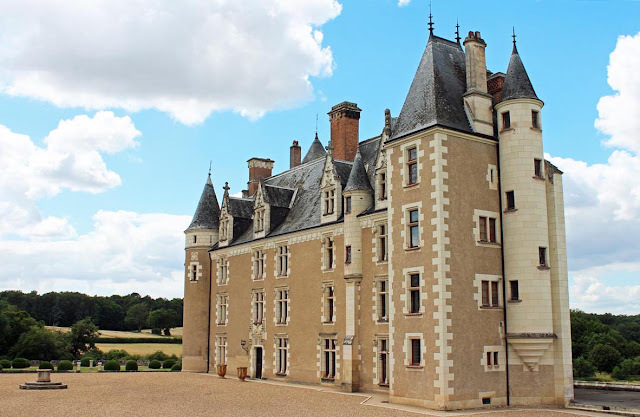 I have a few photos of the Château de Montpoupon that I took on a recent visit with friends. I'm going to post them here over the next few days. This is the château that you see up in the current banner photo. I took that one last year. 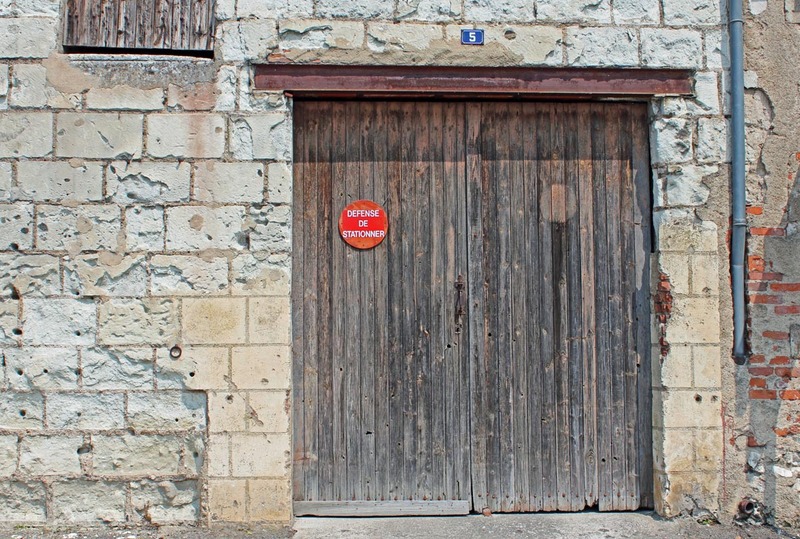 Tasteful little signs tell visitors where to go and where not to go. 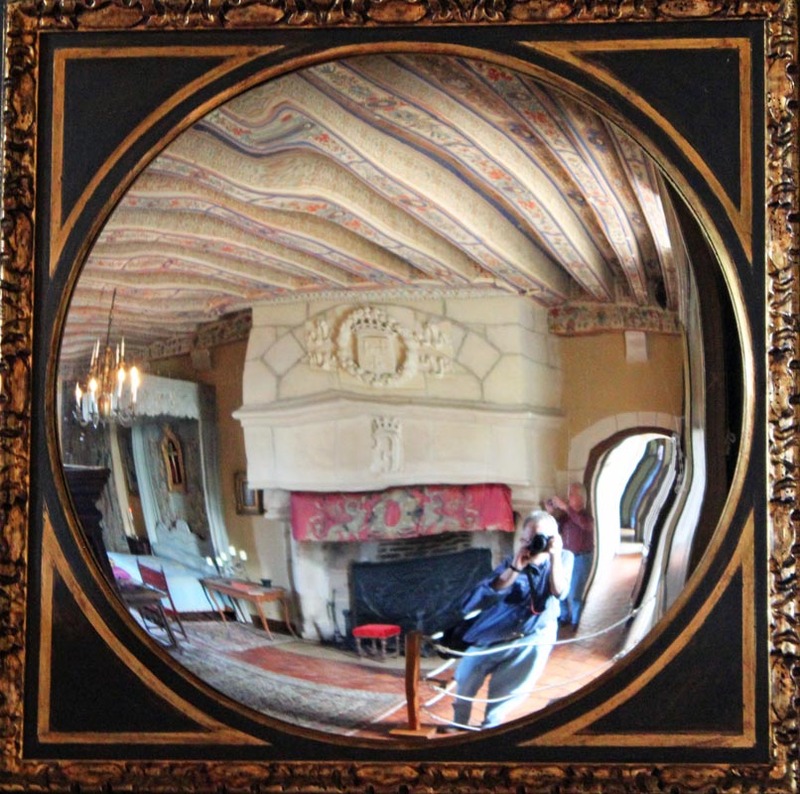 The castle tour has been re-worked to be self-guiding. Which explains the plethora of little signs that have popped up around the property. It's a much better way to see the castle and its grounds because you can wander from place to place as you please, skip parts that don't interest you, or return to parts you liked for a second look. This is where we had lunch a couple of Sundays ago. If memory serves, I had a smoked salmon appetizer and a lamb confit main course. Very tasty. Our thanks to Peter and Jill. 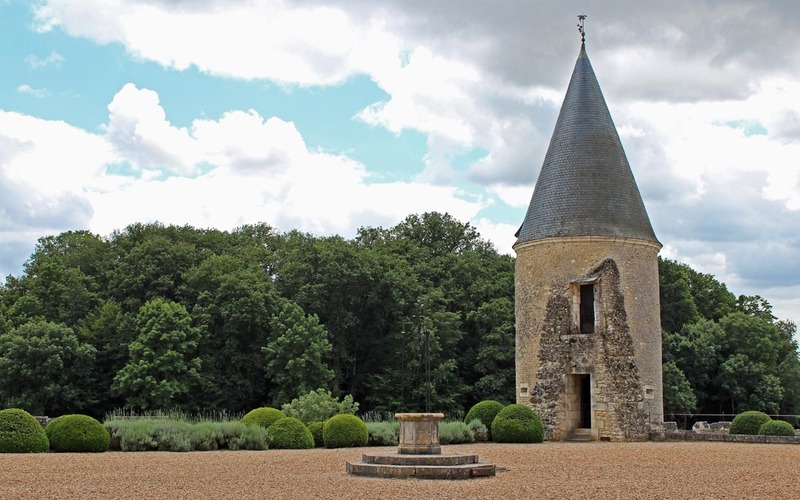 The Castle Inn at Montpoupon. Photos taken on Friday 29 June 2012. Wandering among the stalls with wine tasting (on the right). On Wednesday, friends Jean and Nick came for some wine tasting (at one of our neighboring wineries) and dinner. We were lucky to have a dry day and a relatively warm evening. We got to enjoy our food outside on the deck. 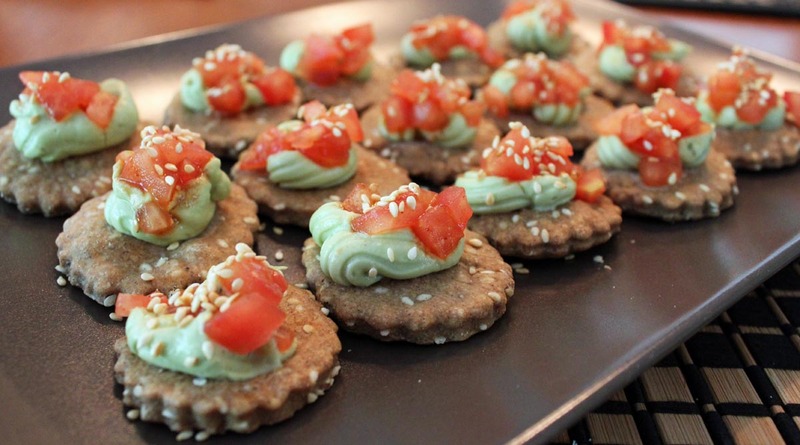 Avocado mousse on buckwheat sesame crackers topped with chopped tomato and toasted sesame seeds. The meal was kind of a hodge-podge of things. 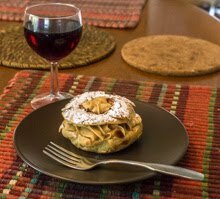 For the main course, I made a pissaldière (thanks to Susan for the inspiration! ), a pizza of caramelized onion with anchovies and black olives. The origins of the dish are in the south of France, Nice specifically. 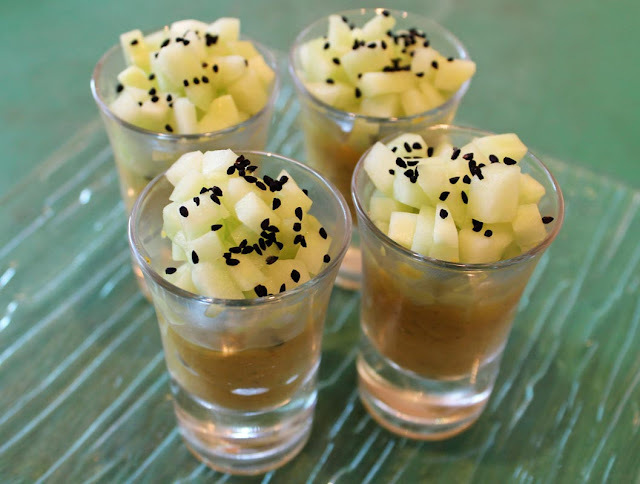 Little glasses of spicy squash puree with diced cucumber and onion seeds. Otherwise, the food was a series of small hors-d'œuvre. We started with goat cheese mini-muffins which I've made before. They were served along side home-made buckwheat and sesame crackers with an avocado mousse, topped with diced tomato that had been dressed with a smokey chipotle tasbasco sauce (I think that was my favorite of all the dishes). Servings of hummus and diced tomato, still in the fridge. Ken mad a batch of his famous champignons à la grecque (Greek-style mushrooms) that we served in small individual bowls. This was followed by little shot glasses containing a spicy squash puree topped with diced cucumber and black onion seeds. 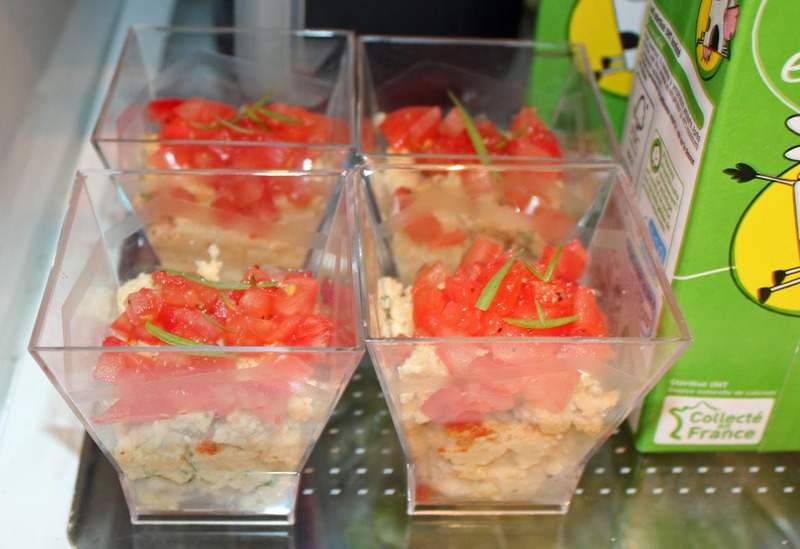 Next up were servings of hummus (a puree of chick peas and sesame) topped with chopped tomato and sprigs of tarragon. We also had a saucisson aux noisettes (slices of dry pork sausage with hazelnuts) to nibble on. 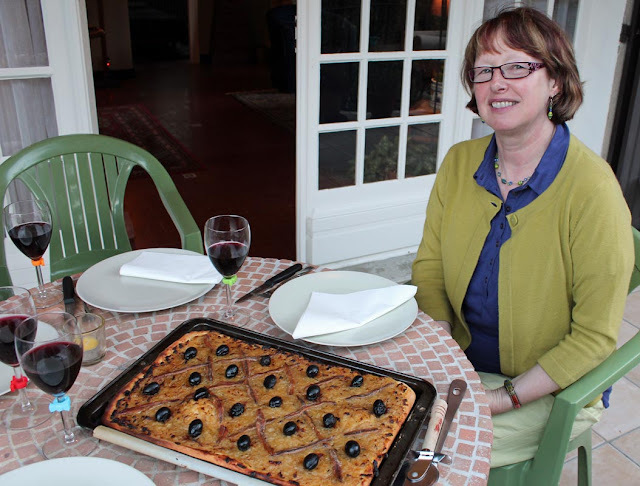 Jean smiles as the pissaladière is served. Oh, and there was wine. After the pizza course, we had a tomato and mozzarella salad. Jean brought the dessert: her version of Nigella Lawson's chocolate Guinness cake, which was terrifically good. I'm sorry I didn't get photos of everything, but for some reason, as the evening went on, the photos got more and more blurry. The market is the only place I'm seeing eggplant right now. The plants in our vegetable garden have slowed down due to the lack of warmth. They're not even flowering yet. I still have hope. 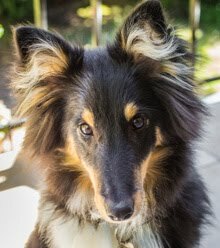 On one of the few sunny days we've had lately, we were invited to a barbeque at the home of some friends. It wasn't really a barbeque but rather the smoking of cured salmon. Delicious. A summery scene. Oh, and I don't smoke; they belong to a friend. We're having quite the damp and chilly summer so far this year. And while we would enjoy a tad more sun, the snails and slugs are living it up. 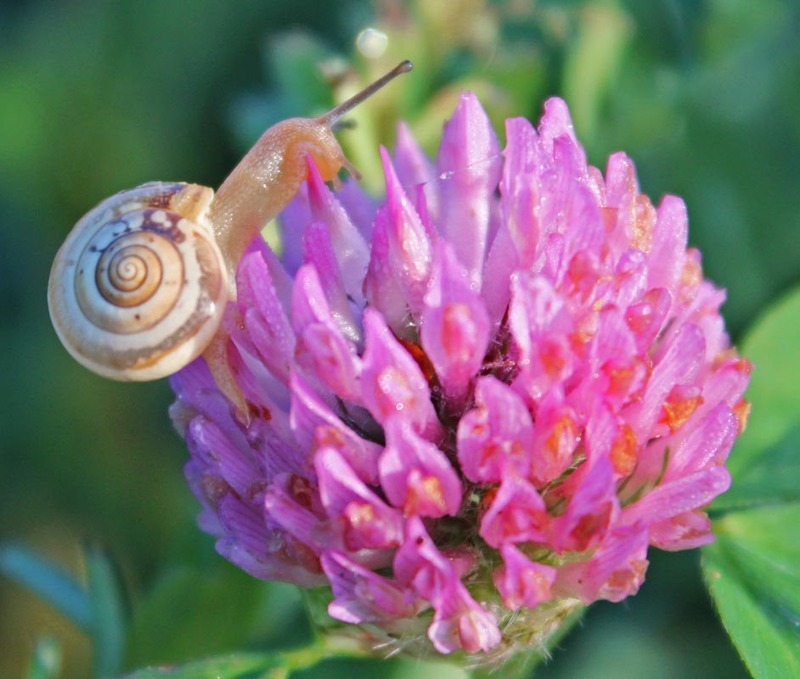 A snail on clover. Over and over. This sign sums it up. 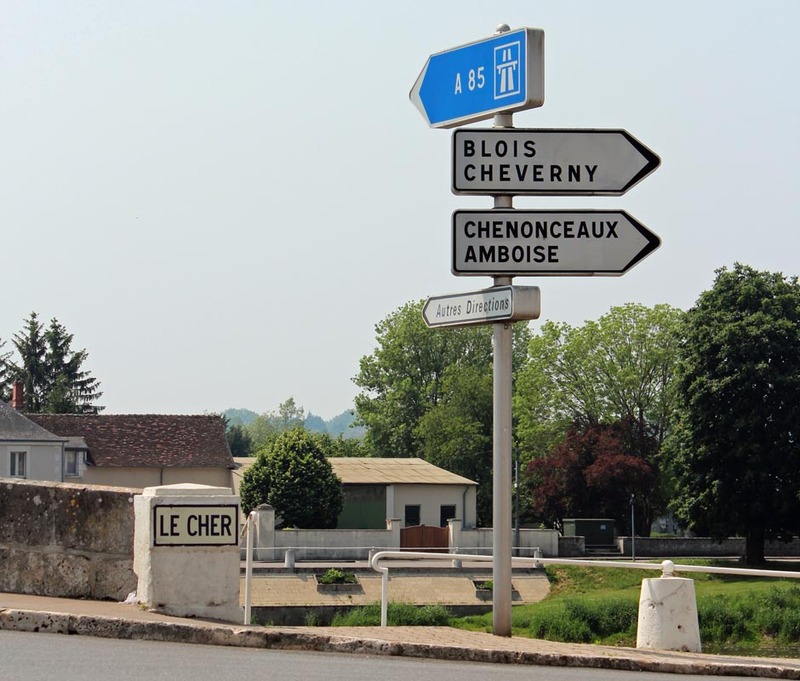 Each one of the towns this sign points to is home to a famous Loire Valley château. And there are many more, most open to the public for touring. The intersection at the bridge in Montrichard on the Cher River. 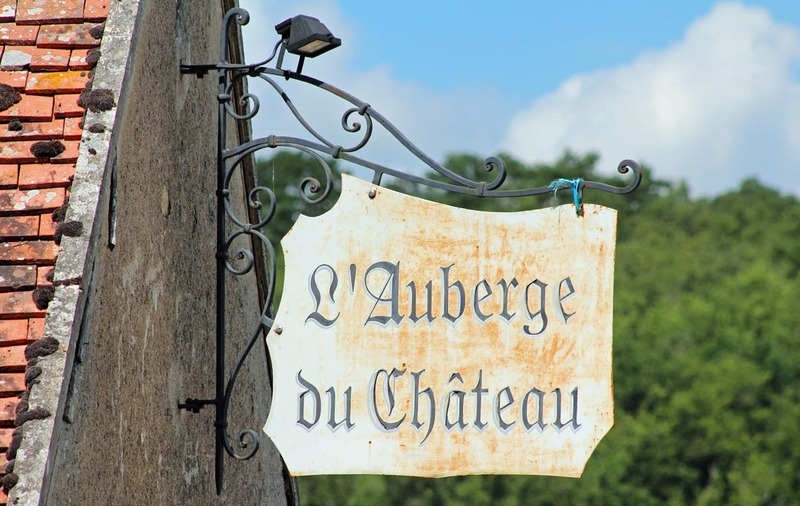 To get to our town you would follow the small sign, Autres Directions (Other Destinations) and cross the bridge. On our way from the car to meet our friends for lunch in Montrichard, I passed these doors. They're both garage doors on buildings in town. Obviously they're not new, nor are they in particularly good repair. This door slides on rails affixed to the exterior of the building. But, I'll bet they work just fine. And they really look nice all worn and weathered. 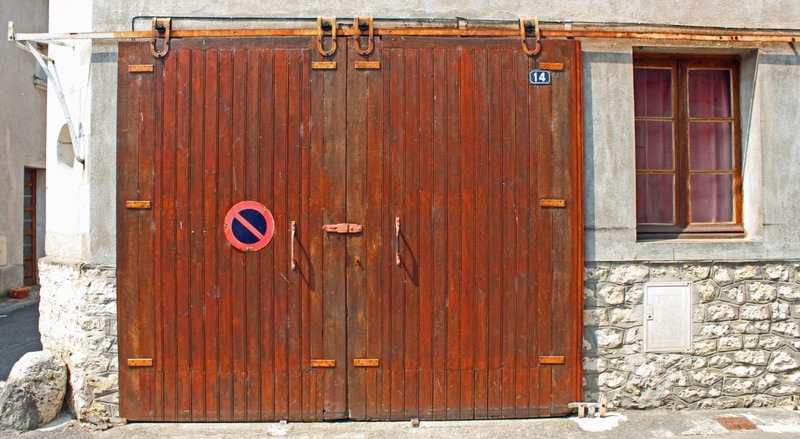 Now this reminds me of my own garage door. It's not in great shape either. The door has four panels that I must open and fold back manually. If the car is in the garage (mostly in winter), the chore of opening the doors to get it out really makes me think twice about going anywhere. This door swings open. Both doors have "no parking" signs on them. And once the car is out, I have to go back and close the doors behind me. Then, naturally, I have to repeat the process in reverse when I get home. I really have to want, or need, to go out in the winter. 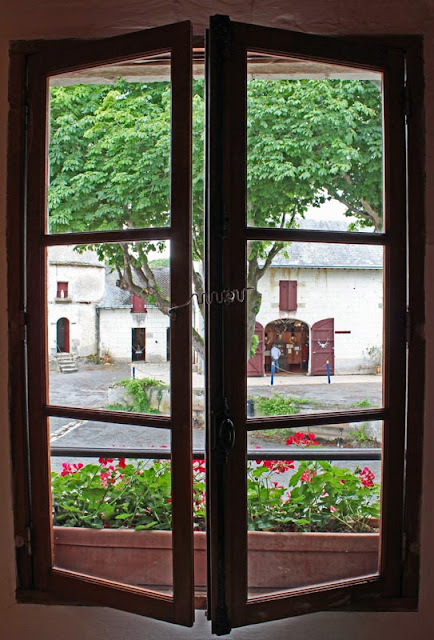 And now, back to France. This is the river we live on, Le Cher. I took the photo at the bridge in Montrichard, a town a few kilometers downriver from us. We were just back from our trip and had scheduled a meet-up with some Australian blogger friends. The Cher River glides under the bridge at Montrichard. 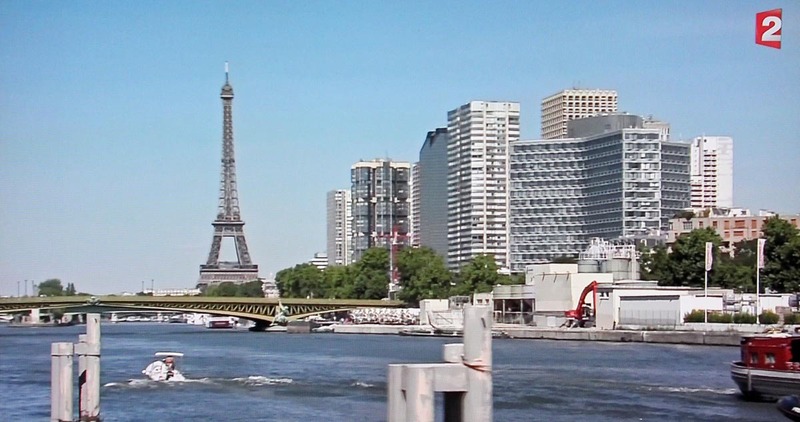 These buildings are on the opposite bank from town and the spot is called Le Bout du Pont (Bridge's End). We had lunch on the square in town. It was a beautiful day and we had a great meal under the shade trees. The fog of jet lag had started to clear and we felt pretty good. Ken among the happy folks from Down Under. The occasion was the visit of two Australian couples. The first, Leon and Sue from outside of Melbourne, we had met a time or two in previous years. 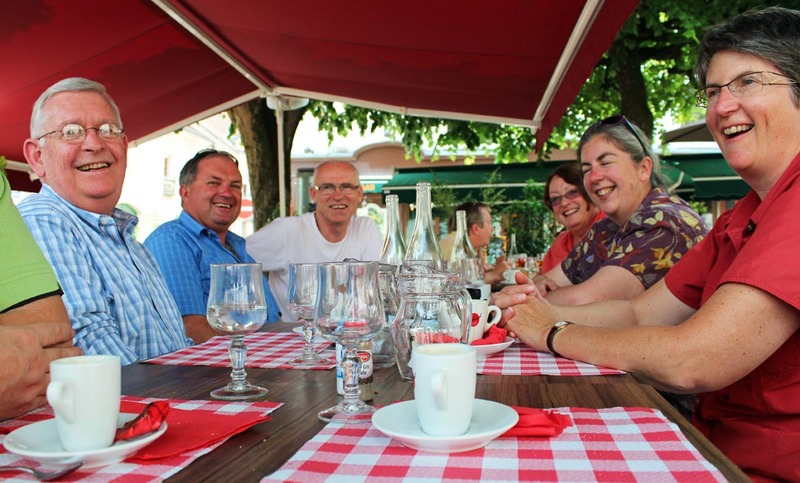 This year was a "milestone" birthday year for Sue and she and Leon spent about a month traveling around France (again!). The second couple are the sister and brother-in-law of yet a third couple of Australians who live not far from us: Susan and Simon who tend the blog called Days on the Claise. On Saturday morning, we packed up the car and headed out of Hyannis. The hotel guy had told us that if we got to the bridge before eleven a.m., we'd have no problems with traffic. He was right. Because we had time, we took the scenic route through Falmouth, dipping down through the southwestern part of the cape before heading back to the bridge. Crazy Eddie's on Town Wharf, Plymouth Harbor. Our first errand on our way back to Boston was to stop at an L.L. Bean outlet store in Wareham. We found it pretty easily in a large shopping center and spent about a half-hour shopping. Ken and I both found some nice shirts for good prices. Then we had to stuff them into our luggage. Yes, that was us you saw unpacking and repacking the parking lot. Tails of the Sea. Get it? I think these might be whale-watching boats. Our second errand was to find a place for lunch. We headed to Plymouth, back up on the coast on the way to Boston. I'm sure I've been there, but I only have a vague memory of it. We made our way to the waterfront very near the famous rock, then drove northward. It was lunch time and we were ready. Ken found a parking spot near a large pier that is home to a large bar and grill called Crazy Eddie's. The car was parked and we were hungry; this was the place. The Mayflower II. It's bigger than I thought it would be, much larger than Henry Hudson's Half Moon. We both enjoyed a huge servings of fish and chips. Delicious. The view from our table out over the water was spectacular, as was the weather. Warm, dry, sunny. The restaurant filled up as we finished, then we headed out for a walk around town before the final drive up to the airport. It was all very pleasant. 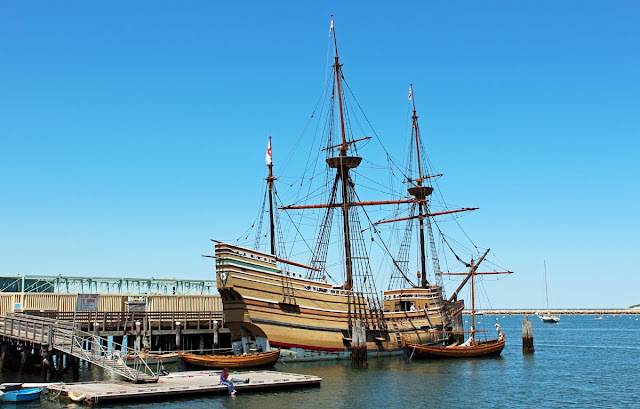 We had a look at the Mayflower II, a replica of the famous ship that brought those religious fanatics out of England to the New World. Then we went to the Temple of the Rock to view, well, the Rock. It's a rock. Yup. It's a rock. 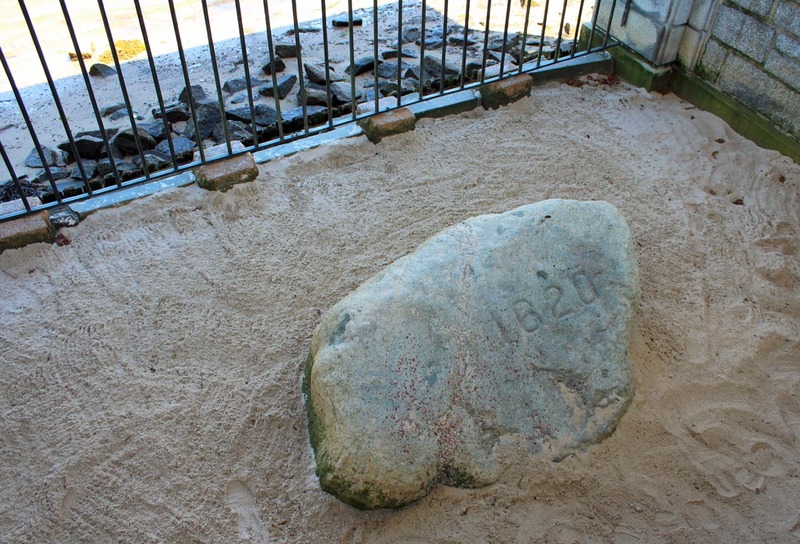 Apparently the original rock was removed and chipped apart over the years. This is all that's left. A quick stroll through town took us back to the car and we headed to Boston and our overnight flight home to France. What an amazing two weeks we had. Thanks for sticking with me through two months of vacation photos. If nothing else, these blog entries will serve as a record of our trip and help jog our memories in our dotage. Our few hours at the tip of Cape Cod came to an end. It was nice to see the place I've read so much about and I'd like to go back one day. But there's already too much on my "one day" list. I guess you can't do it all. I don't know who they are, but they're in my picture. The drive back to Hyannis was uneventful and I probably slept most of the way. Ken drove. I woke up just as we were getting close to our turn, but we missed it anyway and had to double back. We opened up the bottle of wine we bought and had a glass or two before bed. Well, not a glass; a plastic hotel cup. The next morning we would drive up to Boston for our evening flight home, but we had a few stops to make along the way first. Our dinner in Provincetown turned out to be... pizza. With all the choices, all the seafood, all the fancy, we went with something simple and comfortable. I think pizza is my favorite food group. I will always eat pizza. And when Ken says, "why don't we just get a pizza," I'm there. Even with the decision of pizza made, we still had to choose among the three or four places we saw that served it. The winner was a place called John Dough's. 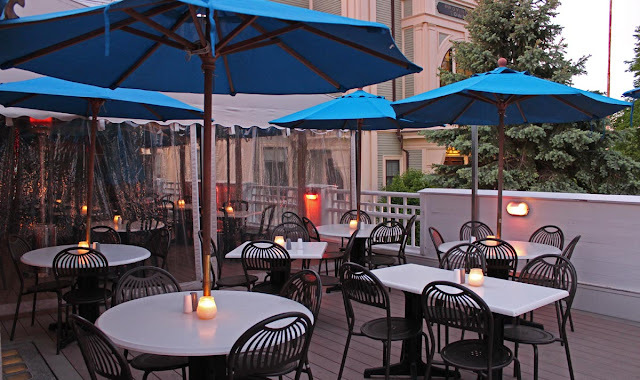 They had outdoor seating on a deck one level above the main street and we liked the menu. Individual pizzas baked in a wood-fired oven. And a nice selection of wines by the glass. The outdoor dining deck at John Dough's as we were leaving. It wasn't crowded. As the sun set, one of the waitresses attempted to light the heat lamp near our table. She teetered on a chair and had several "whooosh!" moments with the propane before giving up and calling someone else. He lit the thing on the first try; obviously an expert. The food was good and we enjoyed the atmosphere. And then we headed back to the car. 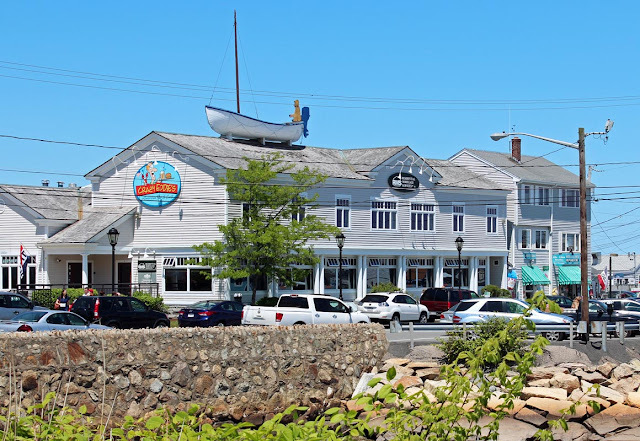 I'll bet this place in Provincetown on Cape Cod is getting a workout this week. We didn't stop in; I took the photo through the front door when no one was looking. 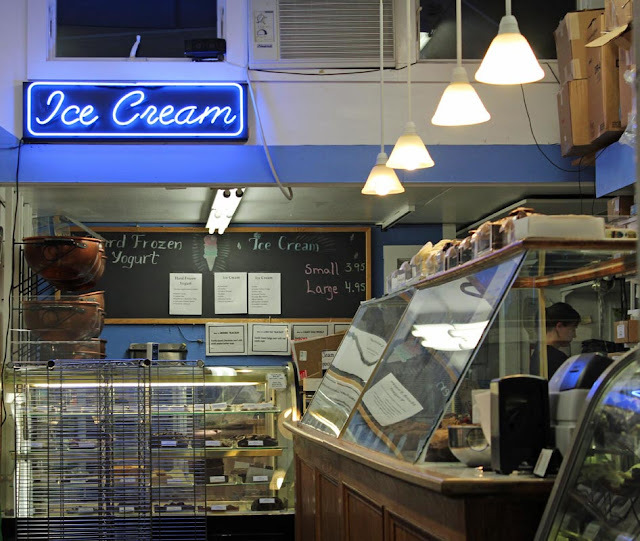 A Provincetown ice cream shop. ...with old Cape Cod. All right, enough with the song lyrics. 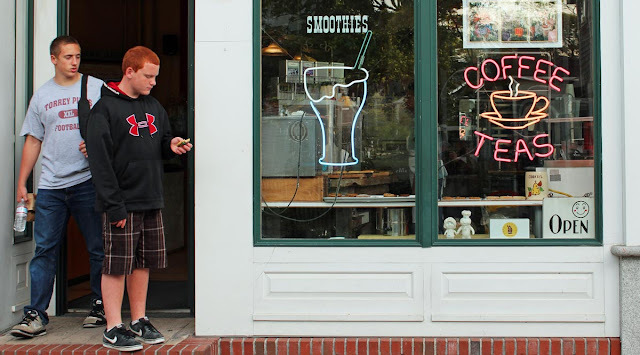 I still have a few photos of Provincetown I'd like to share. It looks nothing like this right now, I'm sure, since this is the Fourth of July week. I'll bet it's packed to the rafters with happy vacationers. An old stone or concrete sign reassembled on the beach. The big event going on this week in France is the Tour de France bicycle race, which started on Saturday. School vacations also just started this weekend, so many people are on the road getting to where they'll spend their holiday. Wimbledon tennis is nearing its finals weekend across the channel. 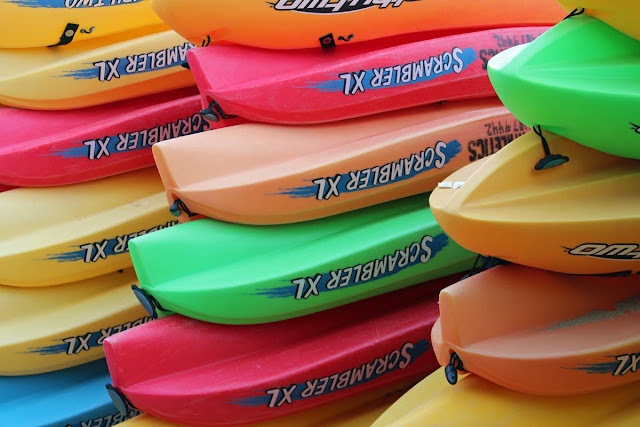 Colorful kayaks piled up (upside down), ready for the summer onslaught. 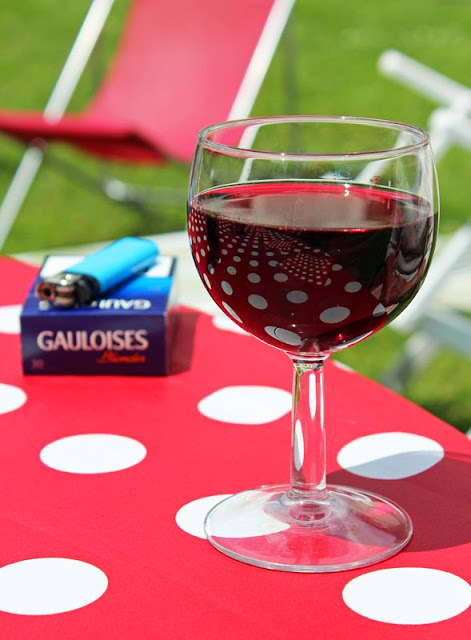 Preparations are certainly being made for France's national day, le quatorze julliet (Bastille Day on July 14). I'm sure our little town will be having its annual fireworks display down on the river. The annual Snail Festival, which is basically a big flea market with food and entertainment, will take place on the 22nd. If the weather is good, we might wander down for a quick walk-through. 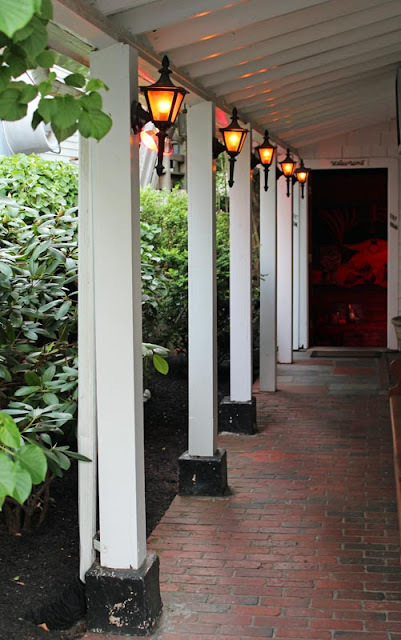 The entrance to a restaurant, club, or boutique on Commercial Street. So, the summer season is officially under way on both sides of the Atlantic. I'm hoping the weather cooperates and we have two good months of sunny days and (relatively) warm temperatures. The vegetable garden will like that.